This stand is suitable for the medium sized models in the iconic Star Yacht range. It is reproduced to the design of the factory product, has an original Star deck transfer applied and is available in authentic Star Yacht colours. 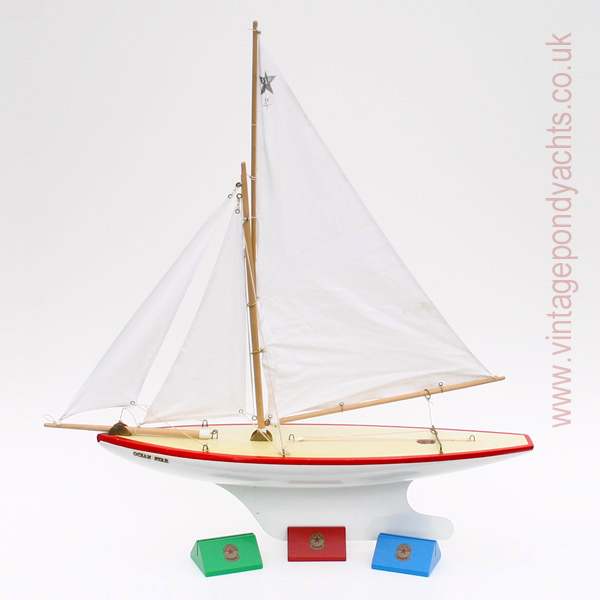 Original Star Yacht stands are very rare, they were always fairly crude in finish and only ever sold in very limited numbers as a way of displaying what were, essentially, toy sailing boats. These, in contrast, are made in hardwood, very highly finished and finally clear lacquered in order to protect the original Star Yacht deck transfer. (The SY/4 and MK/3 are the crossover point in terms of model size and equally suited to either this or the smaller sized stands). To give an idea of size, the display yacht in the above image (not included) is an SY/7 (Ocean Star). Please note: The stand slot size, into which the yacht keel fits, measures approximately 2.7mm and, given the variation in the thickness of steel used on the various models produced, as with the originals it may necessitate the simple packing with card or paper to ensure that the model is held securely within the stand. 83mm (length) x 73mm (depth) x 38mm (height) approx.